The Kingdom of Thailand is coming dangerously close to chaos in recent days and the Associated Press has reported today that the government has revoked the passport of former Prime Minister Thaksin Shinawatra. Thaksin came to power on a wave of populist peasant support but was ousted in a coup and later fled the country before being convicted of corruption. In recent days the "red shirts" supporting Thaksin have taken to the streets and have clashed with the more royalist "yellow shirts" who oppose him. The sitting Prime Minister, Abhisit Vejjajiva, has stated that the leaders of the latest protest will be prosecuted but that he is willing to sit down and talk with Thaksin's supporters. Given the claims of dishonesty made about Thaksin's electoral rise to power I have my doubts that any new elections would be accepted as valid by either side in the red-yellow dispute. Thaksin himself has become more strident, at one point even calling for revolution. In short, Thailand could use some royal intervention. But where is the monarch? 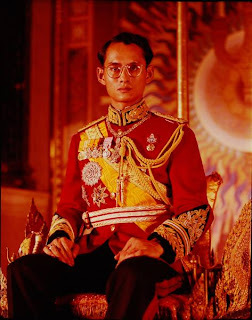 His Majesty King Bhumibol Adulyadej, Rama IX, the "Lord of Life" is as revered by his people as ever and this is just the sort of occasion in the past that would have prompted him to step in, lecture the opposing parties and by immense depths of loyalty which their semi-divine monarch commands among the people bring the crisis to an end. However, the aging king has not been out in public much lately and when he has, even some time back, it was widely noticed that his age is catching up to him. In all probability he simply cannot act in the same manner as in years past and it does not bode well for the future of the Thai monarchy or the peace and order of his kingdom. Because he has been such an outstanding and beloved king the bar has been set impossibly high and many doubt the ability of his son, Crown Prince Vajiralongkorn, to be as successful as his father has been. It would be hoped that Thailand and Cambodia would be examples of the benefits of monarchy to other dictatorial regimes of Southeast Asia. However, they all suffer from the same illness: revolutionary liberalism and/or communism. There are many hints of it in the political movement of Thaksin, Laos is a communist state (directed from Hanoi and with a Vietnamese garrison), Vietnam is a communist state and Cambodia has had the same pro-Viet communist Prime Minister since the current regime was born. Burma is in a class by itself. What is needed in all of these countries (and many others around the world) is a strident campaign to wipe out the revolutionary elements and, in society and education in particular, emphasize a national campaign to encourage loyalty to the monarchist principle and a religious revival to strengthen the bonds between the two institutions. Crown Prince Vajiralongkorn needs to display some leadership and, in the meantime, everyone needs to support and hope for long life for King Bhumibol Adulyadej.